This is my shower curtain. It was the first thing I bought when we moved into our new home a few months ago and I love it more than a human should love an inanimate object. In fact, I may have been heard mumbling on a particularly hard day recently that my shower curtain was my favorite family member....which should tell you both some things about my family and my love for this piece of bathroom decor. Knowing this, it may not come as a huge surprise that I was gazing at its beauty as I lathered up one morning. This particular day, however, I noticed something that I had never noticed before. In between the designs stitched into the curtain was another pattern. My eyes shifted and I suddenly noticed the zig-zagged lines snaking in between the diamonds, performing a show of their very own that I had never before recognized. In case it's been a while since you took Art Appreciation, here's a bit of a review. Below you'll see a classic example of negative space in art. 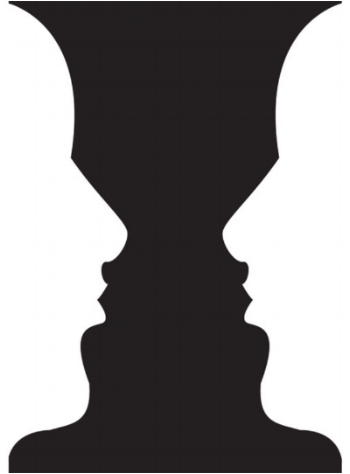 At first glance, you probably see a black vase (the positive space/subject of the composition), but if you shift your perspective you'll see that the white on the sides, the negative space, creates not only the sides of the vase, but also two faces that are nose to nose. This concept of being there but not seen, of being a necessary part of the design and yet wholly unappreciated resonates with me and so I dug deeper into the definitions behind the term. Negative space is the space around and between the subject of an image. Negative spaces are actual shapes that share edges with the positive shape. Just as important as the object itself, negative space helps to define the boundaries of the positive space and brings balance to a composition. Musicians describe periods of silence within a musical piece as negative space. Seeing negative spaces involves learning to see in a new and abstract way. Negative space is understood by relatively few people, but with a bit of practice, it can help you look at photos (LIFE!!!!!) in a new way. Each of these descriptions of this concept matched perfectly with the work I want to do here, on this site. In my mind, there are three ways that “negative space” applies. Some will consider what is done and said here “negative,” which may scare them, turn them off, cause them to shift their perspective of me, etc. My hope is that we can reframe the word negative, using it as it is used in the term “negative space” as vital yet unseen, as opposed to bad. I want this to be a space where hard things can be said, seen, read, recognized, held. I want this to be a space where people can see their stories reflected and/or can better understand the stories of people they love. I want this space to provide the tools and inspiration to create other spaces in daily life for hard but important language and conversation. Now that the term “negative space” is in my consciousness, I see examples of it everywhere, both in the typical use of the term and also in this newfound function. I find myself looking more closely at everyday objects, moments, and interactions, intentionally shifting my perspective to look for the negative space and to think about the role it plays. Now that I see it, it can’t be unseen. and to join me in this safe, thought-provoking, comfort-zone challenging negative space.